Together, with Treasure Island Resort and Casino, Knutson celebrates the completion of the $7 million, 16,000-square-foot remodel of the Tradewinds Buffet. Planning for the project began in Feb. 2015 and its grand re-opening is on Sept. 3. Located inside the resort and casino in Welch, Minnesota, the project presented many challenges, including a complete remodel of the buffet while the surrounding casino and adjacent kitchen remained fully operational. A full-height partition wall was built to protect and separate visitors, guests and staff from the construction area. A temporary buffet was built and utilized by guests and visitors during construction. The remodeled restaurant has high-end finishes that came from locations around the world, including natural stone onyx, a variety of tiles and ultramodern light fixtures from Italy. Some items, such as the natural stone onyx, required custom installation and had lead times of six to eight weeks. The Tradewinds Buffet serves an average of 15,000 guests per week and required a streamlined schedule of only 92 calendar days to allow Treasure Island to continue to offer their guests a one-of-a-kind experience. The remodel is the first major upgrade for the buffet since Knutson built the original restaurant 14 years ago. Designed by RSP Architects of Minneapolis, the restaurant features modern finishes, including glass mosaic tiles, lighted onyx stone walls and an ultra high-tech video display wall. The new buffet will serve breakfast, lunch and dinner seven days a week. Knutson has completed multiple design-build projects for Treasure Island Resort and Casino. 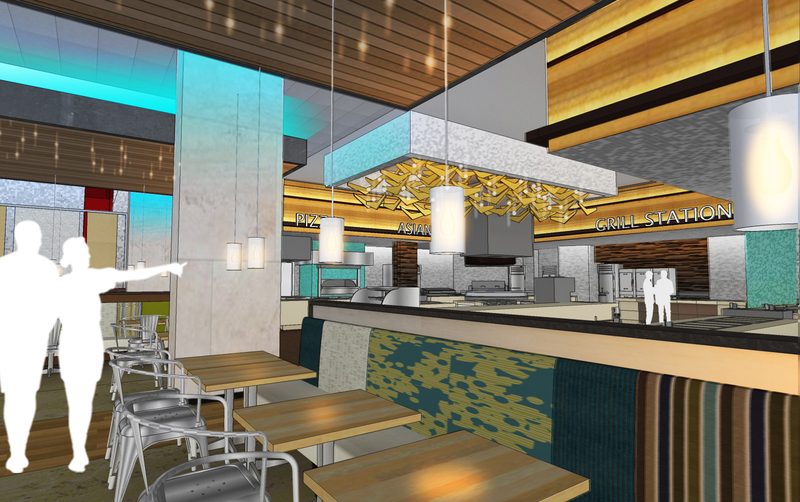 “We’re proud to be their construction partner on the recent remodel of the Tradewinds Buffet. These projects continue to transform their facility into a high-end regional destination for gaming and entertainment,” stated Dave Bastyr, Knutson Construction’s executive vice president of Minnesota. In addition to Knutson Construction and RSP Architects, the project team consists of Robert Rippe & Associates, MEP Associates and Palanamisami & Associates.